There were several stages of this series of images. Stages in shooting, in printing, in critique, in reprinting. 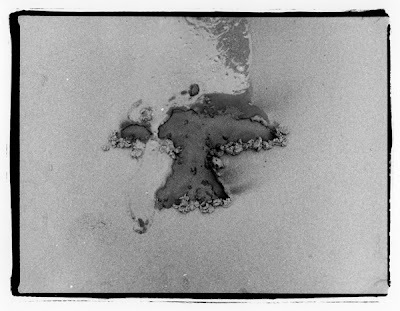 Even the actual creation of the original raven in the sand had to be redone because when the tide came in, it washed away immediately, without the slow, organic decay that I was originally looking for. I worked within the constraints of what I was able to do. 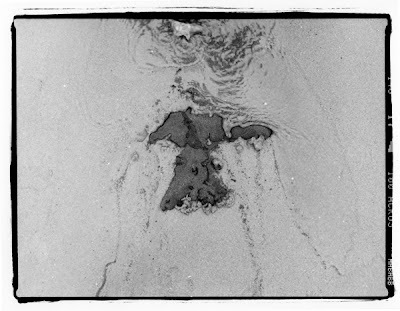 When the first raven washed away, I decided to have my assistant (one of the only images that I actually had someone else present during shooting) bring me water and wash the raven away and more slowly, with cup fulls of water instead of the power of the ocean herself, and the resulting images were prolific and highly varied. During the processing, I must have accidentally been a little over aggressive, as there is evidence of surge at the edges, where the negatives were somewhat more dense. In the first round, this didn't really work to my advantage, as you can see in the images below. In this first one, the raven was carved into the sand with my finger. This is before I added the craft sand that I brought, which is inherently much darker than the natural sand of the beaches of Santa Barbara. During printing, I had so many images to work with that I thought it would be to my advantage to create a story image. I haven't successfully created a story since Self Portrait V and it is something that I wanted to maintain. 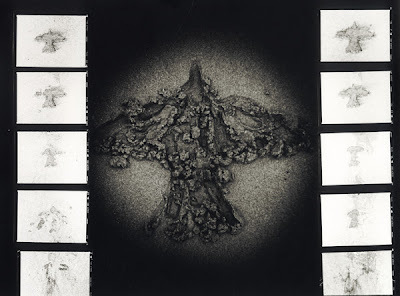 So, I attempted to lay the negatives out on the paper and create a contact print of the images degrading on top of the image of the raven's more skeletal appearing form after it had just been carved. The first attempt was not successful, but I thought that it was very interesting and liked the look and the concept that perhaps there is more to the image that the viewer is not privy to. But I also wanted to get the shot that I intended, which just called for a great deal more burning at the edges to get some information in the side panels. But I was also still curious with the concept of creating a new landscape, a new form composed of smaller forms that make a new meaning and a new whole. I am not really that pleased with this image, as the ultimate representation becomes not only too literal, but also doesn't make a greater statement, which is becoming more important to me as I progress through the program and try to fine tune what it is that my project is ultimately going to be about. After bringing the above images to class, it was suggested that I find some of the deteriorating images from the side panels and make full prints of them, as they are generally more intriguing than the carved image. The concept of the evolution of the raven into its different forms, rather than my intended form for it originally, became the more important value to be interpreting. 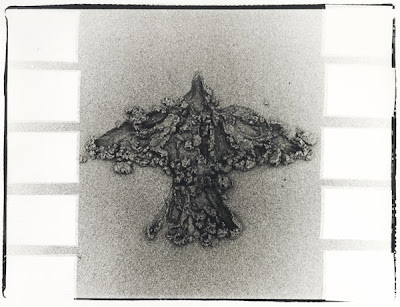 I went back to the darkroom and printed anything that I thought had a greater meaning, or a specifically interesting visual statement. I liked the way that the wing of this one was somewhat separated from its body which still maintaining a kind of contiguity. Besides that, the wind had picked up and the thin, black sand that had been poured into the carved mold and turned it into a wispy trail indicative of movement or speed, as well as a reminder of the insubstantial and impermanent nature of all life. I thought that this one had an interesting background, like the sort of swirling, mystical void that I always associate with the concept of walking towards the light. It seemed like a good place to start, to think about the afterlife, the movement and transition of the bird, of the spirit, of angels and demons. 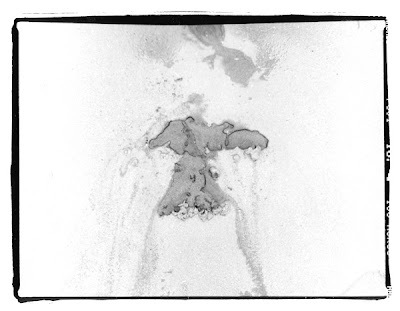 My classmates, upon looking at this image, found several other ravens in the murder of this one, something for him to follow wherever the vortex might lead. 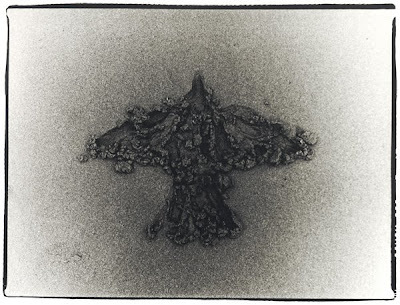 I was encouraged after the second critique to try and print something lighter and with less substance, to really accentuate the black sand on the lighter, gray sand. 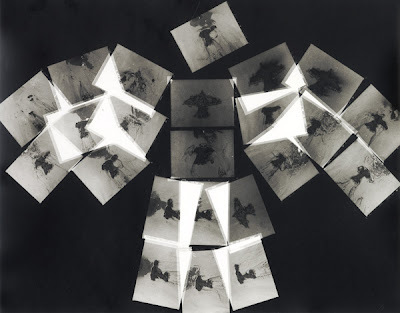 To make a composition that was more thoroughly the clean expanse with the forms of the disintegrating ravens in place. With this one, I couldn't help but see the second raven, the one leading the way into the sky and out of the frame. I titled this, the final evolution of the series, I Will Follow.